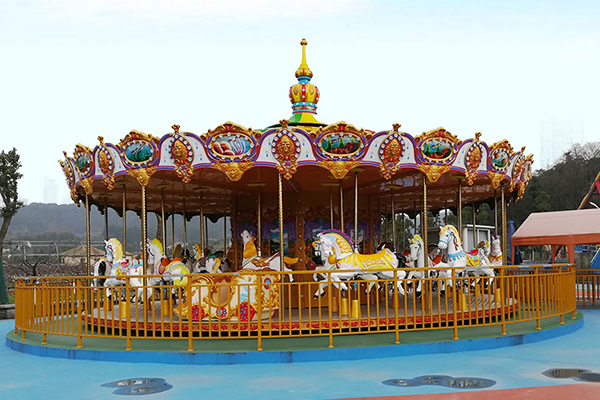 Carousel, also named merry go round, carousel horse etc, is very popular among children. Almost every children grow up with carousel, especially for children between 2-4 years old, in their eye, except carousel, nothing is beautiful. There are several type about merry go round, from 2 seats, coin operated mini model to20 seats, double deck, luxury model(also there are customer want 72 even 96 seats single deck carousel, this kind customized model is also welcomed). From kinds of horse model to different animal design, there is always one design which can satisfy you! It is suitable for kindergarten, shopping mall, amusement park, community etc. Invest it, children will bring you much profit!